For Me. That’s how we should read these passages that portray Christ’s suffering. For me. In my place. For my sin. When Jesus was mocked and beaten, it was for me. When he was questioned all night long with grueling remarks, it was for me. When we was mocked and robed and made fun of and shamed, it was all for me. We should never take that lightly. Just because it is something many of us have known for a long time – maybe even our whole lives, we must never make light of what Jesus did for us. It was his suffering and pain that paid the price for our sins. God, because He is holy and cannot allow sin, poured out His wrath for our sin on his one and only Son. This is one reason we should be so offended when we hear some take Jesus’ name in vain. When they reduce him to a curse, or even worse just a part of their every day jargon, it is as if Jesus suffering – all that pain and torture he went through for our sins – is for nothing. Instead, every time we say and hear the name of Jesus we should be brought to such a place of humility because of what he did for us. We ought to be brought to our knees – yes at times literally. Can you imagine yourself there watching all that Jesus went through? Can you imagine yourself seeing him hit, kicked, beaten, spit upon, yelled at, whipped, bleeding, thorns piercing his skin, the flesh of his back torn to shreds…Can you imagine yourself there? Can you see the pain in his face? Can you see his muscles quivering in pain? Can you? Can you see yourself standing on the side of the road, watching from the comfort from your own sandals and clothes – knowing he would also face the humiliation of being naked? Can you see his pain and contrast it with your sin? Can you see his battered body – beaten for you – and contrast it with your own body, still in tact. Your body paid nothing for your sin. But Christ’s body paid everything. Can you see it? Can you see Him? Chances are, he would have been so beaten it would be hard to recognize him. For You. For You. Can you see what He did for you? For Me. Christ suffered for Me. 54 Then they arrested Jesus, led him away, and brought him into the high priest’s house. But Peter was following at a distance. 55 When they had made a fire in the middle of the courtyard and sat down together, Peter sat down among them. 56 Then a slave girl, seeing him as he sat in the firelight, stared at him and said, “This man was with him too!” 57 But Peter denied it: “Woman, I don’t know him!” 58 Then a little later someone else saw him and said, “You are one of them too.” But Peter said, “Man, I am not!” 59 And after about an hour still another insisted, “Certainly this man was with him, because he too is a Galilean.” 60 But Peter said, “Man, I don’t know what you’re talking about!” At that moment, while he was still speaking, a rooster crowed. 61 Then the Lord turned and looked straight at Peter, and Peter remembered the word of the Lord, how he had said to him, “Before a rooster crows today, you will deny me three times.” 62 And he went outside and wept bitterly. 63 Now the men who were holding Jesus under guard began to mock him and beat him. 64 They blindfolded him and asked him repeatedly, “Prophesy! Who hit you?” 65 They also said many other things against him, reviling him. 6 Now when Pilate heard this, he asked whether the man was a Galilean. 7 When he learned that he was from Herod’s jurisdiction, he sent him over to Herod, who also happened to be in Jerusalem at that time. 8 When Herod saw Jesus, he was very glad, for he had long desired to see him, because he had heard about him and was hoping to see him perform some miraculous sign. 9 So Herod questioned him at considerable length; Jesus gave him no answer. 10 The chief priests and the experts in the law were there, vehemently accusing him. 11 Even Herod with his soldiers treated him with contempt and mocked him. Then, dressing him in elegant clothes, Herod sent him back to Pilate. 12 That very day Herod and Pilate became friends with each other, for prior to this they had been enemies. 18 But they all shouted out together, “Take this man away! Release Barabbas for us!” 19 (This was a man who had been thrown into prison for an insurrection started in the city, and for murder.) 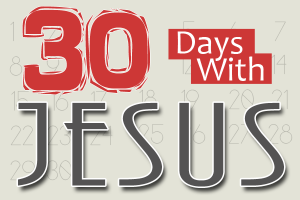 20 Pilate addressed them once again because he wanted to release Jesus. 21 But they kept on shouting, “Crucify, crucify him!” 22 A third time he said to them, “Why? What wrong has he done? I have found him guilty of no crime deserving death. I will therefore flog him and release him.” 23 But they were insistent, demanding with loud shouts that he be crucified. And their shouts prevailed. 24 So Pilate decided that their demand should be granted. 25 He released the man they asked for, who had been thrown in prison for insurrection and murder. But he handed Jesus over to their will. Father, help me never to take for granted all that you suffered for my sin. All thanks be to you, not just my thanks, but all the thanks I can offer and then some. Thank you for suffering for me. Thank you that because of your suffering I can know you and be known in you. Thank you that my sin will not keep me from you because you poured out your wrath on your son for me.